Self-care is something that we cover a lot here on the HealthCorps’ blog and today; I want to talk about the importance of remembering to take care of yourself while trying to care for others as well. There are plenty of articles out there explaining the importance of checking on your “strong friend,” and while it is wonderful for others to take our needs into consideration, it is also important for us to grab the bull by the horns and take accountability in taking care of ourselves. Ever since I can remember, my friends have called me “mom,” and I am sure that you had your “mom,” friend pop into your mind just now in my saying that. While I love the sentiment and quite frankly, welcome the role, I have found it increasingly difficult to step back and remember that sometimes, I need to take a break from that responsibility in order to focus on myself. We care so deeply for those that we love that sometimes we are willing to put their needs before our own. In my role as a Program Coordinator, I have found myself having this conversation with students all the time. In talking with some of my students, I was able to articulate the idea that we are all allowed to hold the hands of others in their moments of need, but it is not our responsibility to guide the way for them. So, what does it mean to walk hand-in-hand with those that we care about? A previous job in customer service taught me this one. Typically, when someone is upset, they will allow their emotions to fog the lenses that they are viewing the world through. We all have a tendency to get so caught up in a problem that we over-think and lose our ability to reason. That said, after answering plenty of calls with disgruntled individuals on the other line, it became very obvious that sometimes we just need to let the frustration out to then, find a solution. 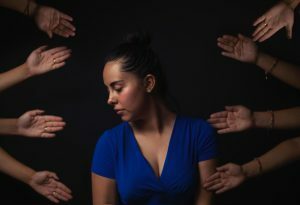 Almost nine times out of ten, once a person is able to vent and they have felt heard, they find that they are able to solve the problem on their own. So, with regard to our friends, sometimes we don’t need to offer advice but rather, provide a safe space for someone to feel heard and empathize with them. Ping ideas back and forth if necessary but it is important to remember that this problem is theirs and not our own. It is important to remember that compassion can be given not only to others, but also yourself. You deserve the opportunity to show yourself some compassion and have it shown to you by others as well. Part of having a healthy relationship with yourself and others is the ability to understand that this should be a two way street. If something becomes too much, or if someone else’s distress in causing you stress, it is important to vocalize your discomfort. Sometimes, we have so much stuff going on in our own lives that we can’t afford the extra mental strain. It is a matter of being forthcoming with that information in a respectful way. Ultimately, it boils down to identifying the moments when you start to become emotionally overwhelmed and being able to draw boundaries for your own good. Avoiding compassion fatigue is critical so, show yourself a little love too!